Not even the rain could end UP’s dry spell in front of a goal. The rematch of last year’s final saw multiple chances on goal for either side but neither was able to fully capitalize. Both teams also needed goal-line clearances to preserve a share of the spoils. “I wanna win. 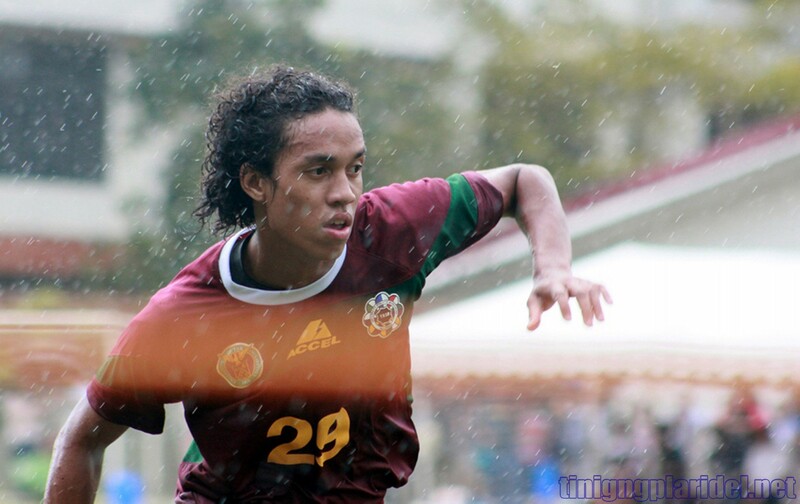 I wanted to win,” said UP coach Anto Gonzales, who was unsatisfied with the draw. With only minutes to go, the Maroons were denied a first goal in four matches when confusion in the UST defense allowed Jinggoy Valmayor to challenge for a bouncing ball in the UST penalty area. The UP striker got his header past the UST goalkeeper, but defender Divino Regis recovered just in time to prevent UP’s winning goal. Minutes earlier, UST’s Shinimar Felongco broke through the UP defense and eventually steered the ball toward goal. Luckily, defender Allen Jose Serna was on hand to punt the ball away. Valmayor also had an attempt earlier in the second half coming from a well-worked play from the left wing involving Michael Simms and Nii Aryee Ayi, but his shot from an acute angle went just wide. The UP defense was tested the entire afternoon by Felongco and UST captain Mario Clariño, but they held on to keep a clean sheet. UP has not conceded a goal in over 450 minutes thus far this season. As for the stuttering UP offense, Coach Anto saw cause for optimism. “I think attacking-wise, we’re improving. We’re getting more chances,” said Gonzales. He also stressed the importance of his players regaining their confidence, especially in front of goal.